Lawful contact you are approached and engaged by an officer. Lawful stop, you are driving/passenger in a vehicle and stopped by an officer. I don't work in LE, so I'm just giving an educated guess here. "Lawful contact" could involve passing a cop on the street when you were out shopping, wating for the bus, walking to school, etc.. If the cop had reason to believe you were illegal, s/he could then ask you for ID. "Lawful stop" is stopping you for doing something the police have reason to believe is breaking the law, e.g. speeding in a car, suspicion of shoplifiting in a store, etc. There is another thread on this where I posted the difference between primary offenses, e.g. a "lawful stop" as I described above, and a secondary offense, e.g. getting stopped for speeding and then being asked for ID. You can try to circumscribe "lawful contact" as only pertaining to vehicle stops until you are blue in the face but as undefined by the original bill, lawful contact under the previous statutory language could mean anything and everything. That is bad law! As the statutes now reads, "For any lawful stop, detention or arrest". Now we have statutory language which is not open to individual interpretation but one based upon court precedent. We know the parameters of a Terry Stop, we have a clear judicial record of what can lead to detention and arrest, something absent from the term "lawful contact". I am pretty sure that pic is photoshopped. Only for the second offense, as I understand it. The first time you're caught, you still just get deported. So, unless they are serial border crossers, no harm, no foul. Wow, you've just described what we've been forced to do under the school lunch program for current children of Ilegals. How ironic. Whoops! 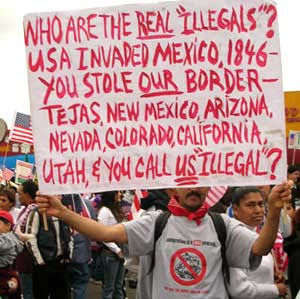 This guy seems to have forgotten about his ancestors killing Aztecs when migrating to Mexico. Last edited by summers73; 05-03-2010 at 12:53 PM..
And besides, I hear tent cities are quite affordable for the state. boompa sees no reason why you can't hold 460,000 "right wing extremists" and tax protesters in jail, according to his other rantings with regards to secession, etc. so I would have assumed that could be extended to illegal immigrants.